Happy Monday y’all!! It’s eclipse day! Are your kids as excited as mine?? Since we haven’t been able to snag any of the sold-out eclipse glasses, we’ll probably watch most of it on NASA’s site, but we’re also going to make these eclipse viewers (just waiting for my coffee to brew). In similarly earth-shaking news, for the first time in a verrrry long time I’m all caught up on consultations and don’t have any scheduled to post! What! So if you’ve been wanting one, now’s a great time! I’m fascinated by these Irish and Welsh and names! I liked seeing Evelyn as a boy’s middle (a la Evelyn Waugh): Humphrey Evelyn (from this post). And speaking of Jemima, beloved of every name lover, I also spotted Jemimas in these posts: here, here. I really liked the nickname here: John Patrick Carnegy “Jock” (from this post), and was so surprised to see both a Jack and a Johnny in this family: Jack Oliver, baby brother of Johnny Robert, Harry Anthony & Joseph James (from this post). I was also surprised at the number of Montys (two of them here and here) and Jontys (as is, as both a first and middle, here, here, here) — Jonty’s a traditional nickname for Jonathan, and you might remember that I suggested it to Rosie and Tim in this consultation. I’m barely scratching the surface with all the amazing names listed in the birth announcement posts, and there are also consultation posts too. Such a fun site! One of you readers emailed me asking about the name Kelly! I haven’t heard anyone consider the name Kelly in a long time, it’s definitely in hibernation until its spring comes again (which it will, as it does for most names). You know I love doing name research! So off to the dusty shelves I went and did indeed find a saint whose name is sometimes anglicized to Kelly: St. Cellach of Armagh. How cool! Behind the Name concurs that Kelly is a form of, as it spells it, Ceallach, whose meaning is uncertain but could include “bright-headed,” or from Old Irish ceallach “war, strife” or ceall “church.” I love the “church” meaning! And in fact, that ties into another very cool thing about the name Cellach: there was a Cellach, the Abbott of the monastery at Iona (not the St. Cellach mentioned above), who fled raiding Vikings with his brethren and went to the Abbey of Kells (though “kells” here not having any connection to Cellach), which had been founded by St. Columba a couple hundred years earlier. Kells strikes me as a really easy way to update the name Kelly while retaining its Irishness and adding a shot of faith, no? Kells gave its name to the Book of Kells, the illuminated manuscript by those monks from Iona of the four gospels that has been described as one of Europe’s greatest treasures, and my favorite tidbit about it is that it “presents the earliest Madonna and Child image in any western manuscript” (source). So I could see a Kelly taking St. Cellach of Armagh as patron, and loving the gospel/Marian/St. Columba connection of the similar-sounding and similarly spelled Kells. This could work for both a boy and girl, and in fact Kelly started as a male name, from the Irish surname. These days Kelly is nearly 100% girl (no. 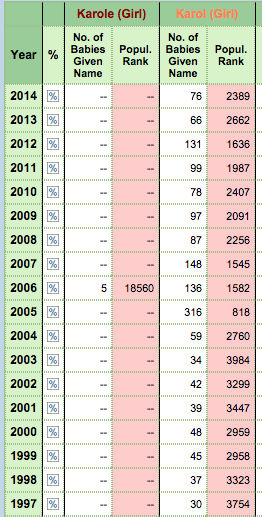 514 for girls in 2016 as opposed to not at all in the top 1000 for boys), but thinking about St. Cellach and the Abbott Cellach definitely shows Kelly’s initial masculinity. I can also see parents loving Kells as a given name, and that might work better for boys these days. For girls, names like Callie, Kayley/Keeley/Kiley, Ellie, and Zelie seem to have filled the Kelly spot for current parents, do you agree? But Kelly’s still familiar and fits in easily with those names I think. What do you all think of Kelly? Do you know any little Kellys? Would you name your daughter Kelly, or have you? What about for a boy? Can you see Kelly working, or do you think Kells is a better option? Or neither? 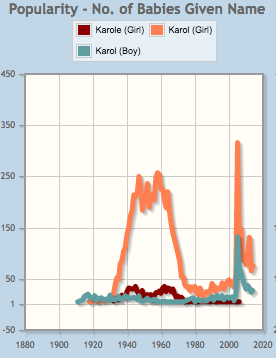 A reader was asking me today if anyone’s using Karol for a boy, whether first or middle name. I know this mama has a boy with Karol as one of his middle names, and I know a little boy in real life who does so as well — what about all of you? Have you seen Karol as a first or middle name for a boy? Has he had any difficulty with the fact that it’s most familiar to [non-JP-loving Catholics] as a girl’s name? One of the question I’ve gotten the most frequently by readers over the past few months is whether there’s any saintly connection for the names Caroline and Charlotte. If I’d had my druthers about me I would have tried to post about this last week on the actual feast day, but since I feel like I rarely have my druthers about me (! ), I don’t usually have it together for feast days and holy days in the sense of posting name-appropriate posts for those days. So the feast day I’m referring to is for my very favorite patron saint for the Charles names, of which Caroline and Charlotte (and Karoline, Karolina, Carolina, Carla, Karla, Carol(e), Karol(e), Carlotta, and Carly) are a part, being feminine variants of Charles: our great St. John Paul II, whose pre-papal name was Karol, which is the Polish for Charles. I know loads of little ones named in his honor in this way. I was surprised to see this, since I think the general perception of Carol(e) and Karol(e) are that they’re still a little dated … but then skimac also shared that blogger/author/apologist/BigCatholicGuy Taylor Marshall and his wife had their eighth baby last week, on JP2’s feast day!, and gave her Carol as one of her middle names. So! Carol(e) and Karol(e) are certainly viable options. There are other patron saints available for Caroline and Charlotte though, which is perhaps particularly helpful for those who already have a little John Paul running around. There are a bunch of Saints and Blesseds Charles — my personal faves are St. Charles Borromeo and St. Charles Garnier, and even Charlemagne — yes, THE Charlemagne (which translates as Charles the Great) — is a Blessed. If you preferred a female patron, there are also Bl. Karolina Kózka, Bl. Theresa Gerhardinger, born Caroline (and also known as Bl. Caroline Gerhardinger or Bl. Karolina Gerhardinger), Bl. Charlotte Davy, and Bl. Charlotte Lucas (Pride and Prejudice fans, take note!). What are your favorite patrons for Caroline and Charlotte? 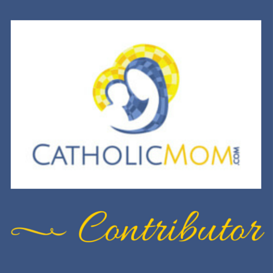 A mama wrote to me asking for suggestions for not-so-normal Catholic names. I don’t have permission to share her name or her children’s names, but I did want to share my response, and get any other suggestions from all of you. I often see in name books certain saints’ last names used as girl’s first names, and often with the note/disclaimer “mostly used by Roman Catholic families” or similar, which I always think is cool. Some of these are: Liguori, Majella, Vianney, Clairvaux, and Piamarta (which I think translates as “holy Martha,” which is kind of cool). The associated saints for those are St. Alphonsus Liguori, St. Gerard Majella, St. John Vianney, St. Bernard of Clairvaux, and St. John Piamarta. I’ve referred to the blog My Child I Love You several times before because of their awesome taste in names — two of their girls are Vianney and Clairvaux, and they’d considered Talbot at one time as well, for Bl. Matt Talbot. There are some saints’ last names that are used for boys, too. Xavier is a great example, although it’s not so unusual anymore. And I think you would want to be a little careful, because some (like those mentioned above) are used almost exclusively for girls, even though they’re male saints’ last names. Some good ones for boys might include: Kolbe (St. Maximilian Kolbe), Campion (St. Edmund Campion), Rice (Bl. Edmund Ignatius Rice), Bosco (St. John Bosco) (Grace just named her baby Bosco! ), Jogues (St. Isaac Jogues, said in French like Joe with a G on the end, but in American English I’ve only ever heard it said like Joe with a “GZ” on the end). There are a whole bunch more here, both in the post and in the comments. Another kind of name I see used from time to time for girls is the names of places Mary appeared. Like: Lourdes, Liesse, Salette (from “La Salette”), Fatima, Guadalupe (actually used for both boys and girls). Liesse is a new discovery for me, and I’ve just been loving it. This sometimes works better within the context of siblings with Catholicky Catholic names, but consider, for girls: Vesper, Eden, Trinity, Pieta. And for boys: Roman, Paschal, Emmaus, Tiber, Creed, Boon. 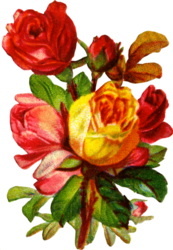 These came from this post (including the comments, nice suggestions offered). This would make them “not-so-normal” only from an American standpoint, but that can be good enough. Like, for girls: Belén (Spanish for Bethlehem), Zelie (French, for St. Therese’s mom, who will be canonized next month), Inessa (a Russian [I think?] form of Agnes), Pilar (from a Spanish title for Our Lady), Paloma (Spanish for “dove”), Brid (form of Bridget, said “breed”), Caoimhe/Keeva (just one example of the million unusually spelled Irish names). For boys: Cruz and …. I’m blanking on more! I keep thinking of Xavier, which just isn’t uncommon enough. Then I just started going through The Catholic Baby Name Book and my own head, trying to find or remember unusual saints’ names I’ve heard, and came up with, for girls: Quiteria (I actually know a mom who was considering this for her daughter), Amata, Keziah/Cassia (biblical), Pia (though I think Piamarta works better because it doesn’t focus so much on the “pee” sound. So unfortunate, because Pia’s a sweet little name). And for boys: Athan (like Ethan, but not — I believe he was a Welsh saint), Inigo/Eneco (St. Ignatius of Loyola’s birth name; also The Princess Bride! ), Ephraim/Efrem (not terribly obscure, but rare), Ivo (more popular in England/Europe I think than here), Aaro (Finnish for Aaron), Eleazar (form of Lazarus). What do you all think? What names can you add that fit the criteria of “not-so-normal Catholic names”? The thing I love most about these is their possibility as fresh-seeming nicknames or variants of Agnes, Emma, Isabel, and Elizabeth for girls (I’ve actually heard of a woman named Elizabeth who goes by Libbett), and variants for honoring female relatives for boys (like, naming a boy Emmett after Grandma Emma or Hibbs after Grandma Elizabeth or Isabel). What do you all think?